Limestone forms by sedimentation of coral and shells (biological limestone) or by the precipitation of calcium carbonate (sedimentary chemical limestone) from in marine waters. Limestone comes in many forms (e.g. chalk, coquina, fossiliferous, lithographic, oolitic, travertine, tufa). It can be crystalline, clastic, granular or massive. Materials are considered limestone if they have 50%+ CaO. The production of calcium oxide by roasting limestone is one of the oldest chemical transformations done by man (calcium oxide then reacts with carbon dioxide to regenerate the calcium carbonate, the basis of mortar and concrete). As such, CaO powder would be unsuitable as a ceramic material. In ceramics, the value of calcium minerals relates to their readiness to form melt solutions with SiO2 and these solidify as silicates on cooling (glasses and glazes). The calcium carbonate used in ceramics is simply limestone ground into a powder (not calcined and is therefore stable). While not intuitive (given the high LOI and propensity to regenerate), in some countries (e.g. 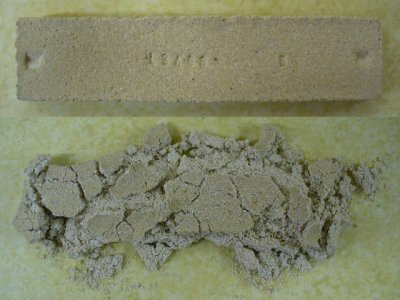 Thailand) limestone powder (about 10-20%) is added to clay bodies (fired 700-900C). Many benefits have been noted, including: Lower water content needed (and thus lower drying shrinkage), more dense fired matrix, elimination of black coring, increased strength at lower firing temperatures and lower clay percentages in the recipe. The analysis provided here is hybrid (not theoretical or actual). We started with the theoretical calcium carbonate analysis of 56.1 CaO and 43.9 LOI. Then we added 1% impurities of MgO, Al2O3 and SiO2 plus 0.5% Fe2O3 (all at the expense of CaO). These are amounts that would typically be found in commercial materials. Many are less pure than this (having a lower CaO content), some highly processed grades are more pure. What happens when a limestone clay mix is fired to cone 6? The top bar is a mix of calcium carbonate and a middle temperature stoneware clay (equal parts). On removal from the kiln it appears and behaves like a normal stoneware clay body, hard and strong. However, pour water on it and something incredible happens: in a couple of minutes it disintegrates (as it rehydrates). And generates lots of heat as it does so.